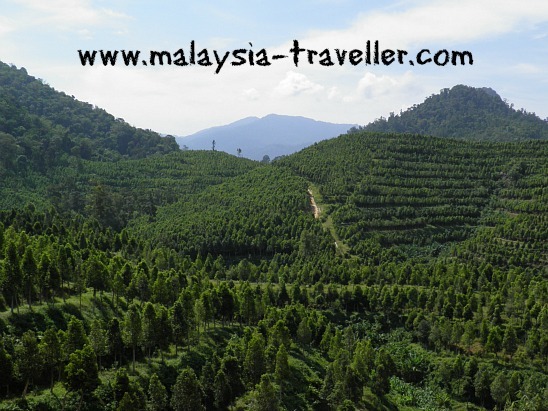 Gaharu Tea Valley is an agarwood plantation just outside Gopeng, Perak and has become something of an agro-tourism destination. Agarwood (also known as gaharu in Malay or oud in Arabic) is an aromatic resinous wood which forms inside aquilaria trees when they become infected with a certain type of mould. Agarwood is highly prized for its powerful, exotic fragrance as well as its medicinal and health-giving properties. Its popularity in Middle Eastern and Chinese cultures and its high commercial value has led to agarwood becoming rare and endangered in the wild. This 300 acre project, with over 200,000 organically cultivated trees of various ages, is helping to conserve the aquilaria species. The project began around two decades ago but the facilities have only been open to the public for the past couple of years. The tree has multiple uses and various products are made in their factory and sold in the Gaharu Retail Shop which are both located onsite at the plantation. It is claimed that tea made from Gaharu leaves can help reduce blood sugar levels, lower blood pressure, improve sleep quality, treat hangovers, constipation, flatulence, gout and asthma. Anti-cancer and anti-aging properties are also claimed. I tried a small cup in the retail shop. The taste is not bad! For RM10 you can take a 20 minute guided minivan tour around the estate. 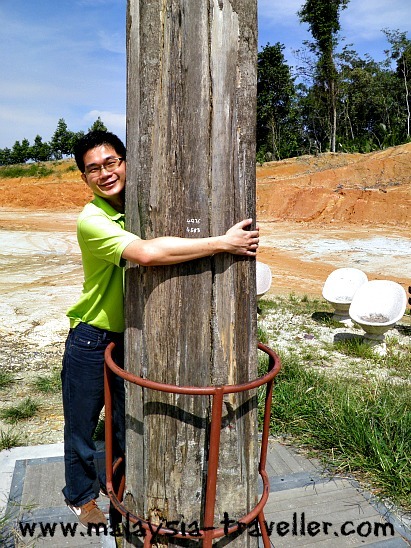 One of the highlights is to hug the trunk of a mature gaharu tree which is believed to be auspicious. Sadly, the tree they use is looking past its best and has had to be chopped off at the top. They are building a new tea house with a mock cave entrance which will provide visitors with a fine view over the plantation. You will also see a swiftlet farm on the estate. My guide told me that gaharu trees give off a natural mosquito repellent which means there are very few mozzies here. That is good for humans but not so good for swiftlets who like to eat mosquitos. The plantation is surrounded by a high crenellated wall designed to resemble the Great Wall of China. The wall serves the practical purpose of keeping out intruders who might try to steal the valuable agarwood or wild animals that might cause damage. A 10 year old aquilaria tree can contain agarwood worth RM 25,000 so they are worth protecting. Who says money doesn't grow on trees! When I heard about that, I decided to purchase a 3 foot high gaharu sapling to plant in my garden. Seedlings were on sale for RM38. From RM38 to RM25,000 in 10 years seems like a good investment but I need to find out the method of inducing the particular mould to produce the valuable resin. Find the roundabout in the centre of Gopeng, in front of Gopeng Heritage House. From there take the road to Kg. Sungai Itek. 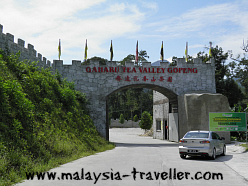 Follow the signposts for Gaharu Tea Valley which is a few minutes drive away. You can find a map on Gaharu Technologies' official website. 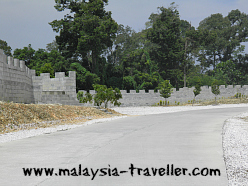 The guided minivan tour around the estate costs RM 10 per adult and RM5 per child. 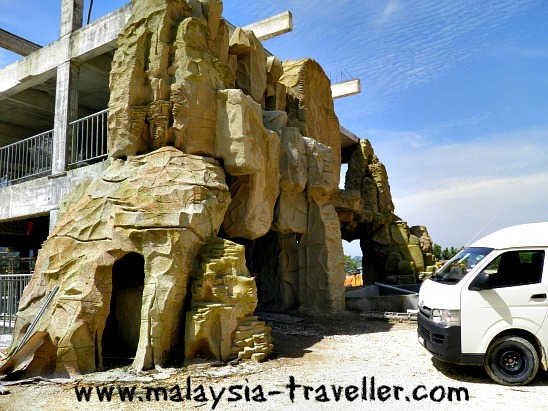 Gopeng Heritage House and Muzium Gopeng are interesting places to visit.